Nippon Seiki has entered the OLED lighting market, and is already producing and offering "low-priced" panels. Low cost is relative of course - the 90x90 mm panel costs ¥8,000 ($100). The company is now offering samples because they want to get user feedback to improve the technology and products. NS are currently offering three kinds of panels: a 90x90 mm square, a 280x38 rectangle and a 140x38 mm rectangle. All the panels are 1.9mm thick and feature 30,000 hours lifetime (LT70). The brightness is 1,000 cd/m2 (maximum 3,000 cd/m2) with color temperatures of either 3,000K or 5,000K. NS says that they are using their existing PMOLED production line and did not make any new investments for OLED lighting. They are using the same fluorescent small-molecule OLED materials as used in their PMOLED displays. 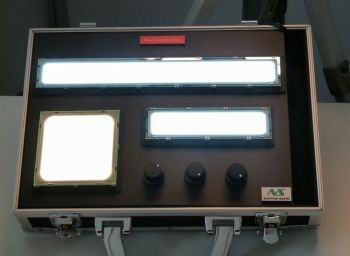 The company sees the OLED lighting market take off in 2015 and is planning to use other materials in the future (including phosphorescent materials). LT 30 means a decrease of lifetime to only 30% of the initial value. What is this compared with more usual LT benchmarks like LT70? I think calculated into LT 70 it is only 5000hours. Is this right? In the original article it says 30,000 hours to decrease by 30% (i.e. LT70 = 30,000 hrs). The text here on oled-info need changing from LT30 to LT70. Yes, you're right. My bad. I fixed the article. Thanks. LT70 of 30,000 hrs sounds nice, but in reality for lighting the lumen output is not the only thing that needs to be stable. For instance is there any info about what the color shift over that period of time will be and how good the uniformity of the panels can be maintained?